The main idea is there will be at least one blog post dedicated to the theme each day in December, hosted by a number of other writers and editors. I’m hosting a guest today, I’ll be hosted elsewhere later, and … AND … if you read to the bottom, you’ll find a chance to win a whole ton of prizes, including a grand prize of TWENTY FREE BOOKS. Every author has experienced the magic of the shower. There is no place like the shower for being struck by inspiration. Sadly, most of the brilliant ideas born beneath suds and spray end up swirling down the drain because the moment you step out of the shower, the ideas vanish. That’s why every writer needs Aquanotes, the water-proof solution to note-taking while in the shower! This remarkable invention writes at any angle and is perfect for those just-before-I-fall-asleep inspiration attacks that leave writers scrabbling for the notepad they always keep beside their bed. However, pens rarely write upside down and by the time the half-asleep writer has managed to adjust into a better position, the idea has disappeared. This is why the space pen is a necessity. Never doubt the power of comfy clothes! All writers know they are far more productive on the days they spend writing in pyjamas. But each writer is different and needs their own particular brand of comfy cute. I have a strong preference for woolly Hello Kitty pjs, but I wouldn’t say no to a fleecey Snoopy onesie either. And don’t forget we write in summer too and might need some lighter yet no less comfy jammies for the warmer days spent at the computer. Some writers like to go the healthy route, cramming handfuls of nuts and dried fruit into their mouths between paragraphs. Others among us prefer real brain-food like chocolate, M&Ms, Skittles, Smarties, cookies, marshmallows, and anything involving peanut-butter. A basket full of snacks to fuel the writer brain would be a truly fantastic gift – just don’t expect your writer friend to share. And along with the snacks, perhaps you could throw in a few beverages of your writer’s choice. Personally, I write best when clutching a glass of delicious pinot noir. Shiraz is fine too. And don’t forget dark roasted coffee, and plenty of herbal tea for those days when the caffeine-induced jitters make typing a little too tricky. If you love your writer, you’ll supply them with exactly what they need be it coffee, wine, or something stronger. Now of course we have to drink our beverage of choice out of something. Make sure you have your writer’s house correct before handing them a Ravenclaw mug when really they’re a Gryffindor and how dare you think otherwise! If you’re not too au fait with all things HP, then play it safe and stick with mugs bearing inspiring messages like ‘there, their, they’re’ – your writer will appreciate it. Also, the bigger the mug the better – obviously! And there you have it. Now you know exactly how to fill the Christmas stocking of the writer in your life. If you have any more suggestions, please leave them in the comments and I will gratefully append them to my list! The author of THE OTHER ME, I HEART ROBOT and the forthcoming SCARDUST, Suzanne van Rooyen is a tattooed storyteller from South Africa. She currently lives in Sweden and is busy making friends with the ghosts of her Viking ancestors. Although she has a Master’s degree in music, Suzanne prefers conjuring strange worlds and creating quirky characters. When she grows up, she wants to be an elf – until then, she spends her time (when not writing) wall climbing, buying far too many books, and entertaining her shiba inu, Lego. You can find Suzanne on Facebook, Twitter, Pinterest, Goodreads, and her website. One more thing! If you like free stuff, remember to enter the giveaway below – there are lots of chances to improve your chances of winning a prize, which includes the grand prize of TWENTY BOOKS plus some more swag! Book Birthday: THROUGH THE NARROWS is Available Today! Through the Narrows, the new historical adventure in the Tomahawk and Saber series set during the French and Indian War, is available in ebook from Amazon today! This is the second book in the tales that began with Language of the Bear, and some early readers have told us that they enjoyed this one even more than the first. Wolf Tongue of the Susquehannock and Lieutenant Hugh Pyke of the British Army barely survived their first mission together. Now with the French and Indian War beginning to flame around them, the frontier of the Pennsylvania Colony is restless. When they’re called back to protect Millers Town from Indian raiders, Pyke and Wolf Tongue discover the settlement is outnumbered and there is no militia to reinforce them. Even worse, Pyke and Wolf Tongue fear the townsfolk harbor secrets just as deadly as their attackers. As Pyke tries to build a haphazard defense with a band of farmers and children against an almost inevitable slaughter, the mysteries of the town begin to unravel. Pyke realizes his life is in danger from the very people he is duty-bound to protect—perhaps, even from the beautiful French outcast who seems to know more than she should. With a final, crushing attack imminent, Wolf Tongue hurries to rescue a kidnapped girl who might be the only hope for the town’s survival while Pyke struggles to protect the innocent. As they carve away layers of deceit, both men must confront the terrible truths behind Millers Town to survive the dangers to their lives, their peoples, and their honor. Through the Narrows continues the historical adventure of the Tomahawk and Saber series, filled with suspense and action that captures the deadly brutality, danger, and strength of Colonial America. Thank you to everyone who’s enjoyed the first book and I hope you like Through the Narrows just as much! If you haven’t worked with an editor (or don’t live with one to hear the end-of-the-day, get-me-the-wine stories), you might not know the work that goes into editing. Let me introduce the talented Rhonda Parrish, who’s doing some great work to make the books we all love and she graciously accepted an offer to give us a little bit about the day-to-day of how an anthology gets put together and edited. And writers, please note she’s looking for great writing right now for a new collection of short stories titled Sirens. Check out the details in the call for submissions here and give her your best work! At first I was angry–No. No I don’t just fix all the typos and then I get my name on the cover. That’s not how this works–but that initial offense disappeared quickly. Because Jack wasn’t trying to minimize the amount of work I put into an anthology, he just honestly didn’t know. Thinking about it afterward it became pretty clear to me that actually, a lot of people don’t know. When they see a book that says ‘Edited by NAME’ on the cover, they don’t understand what that means. And why should they? I’ve been a writer for quite a long time and even I didn’t know what that meant until a couple years ago. Nate offered me a spot on his blog to talk about pretty much whatever I wanted (because he’s awesome!). Originally I was going to talk about my latest anthologies, Corvidae and Scarecrow, but I changed my mind. I want to talk, just briefly, about my process when I’m editing an anthology. What do I do? Why is my name on the cover? Things change from anthology to anthology, but the basic process can be broken down into twelve steps. If I’m not self-publishing, like I did with the Alphabet Anthologies, I write a pitch for the anthology, submit it to an appropriate publisher following their guidelines and then cross my fingers and wait. Once a publisher has accepted the anthology we sort out all the less-than-exciting (but very important) bits such as how I’m getting paid, how my authors are getting paid, how much we’re getting paid, when submissions will open and close, how many stories I can include, what the final word count is going to be, and other things along those lines. During the submission period I continue to try and spread the word about the anthology and make reasonable efforts to let people know if my story needs have changed or refined. For example, with the Sirens anthology I’m aiming to have an equal number of sea-based sirens as sky-based sirens. If 80% of my submissions are for one kind of siren I will try to let potential submitters know (via blog posts and social media) that I’m seeing a lot of that type of siren and thus am hungry for the other variety. That brings us to reading submissions. I read subs throughout the open submission period and separate the stories into those I won’t be using and those I might be. The former receive rejection letters (Even though most will say similar things I type each individually, no copy/paste form letters) and the latter are shortlisted for further consideration. Once submissions close and every story has received an initial response I re-read the shortlisted pieces and cut them back further until I have my table of contents. I could write a whole series of blog posts about this step alone but for now let’s just say it’s a long, complicated and anxiety-producing decision-making process but I work very hard to ensure I have a strong, diverse collection of stories. After all the rejection and acceptance letters have gone out, it’s time for the editing to begin.Most stories go through at least three separate editing stages. First is the substantive editing stage. It’s at this point I send the author an email pointing out any trouble spots I’ve noticed–plot holes, endings which don’t work for me, stories beginning in the wrong place–that sort of thing. Sometimes I offer concrete suggestions on how to correct the problem, sometimes I just ask questions to help the author sort that out themselves. Occasionally we repeat this step several times before the author and I believe the story is the strongest version of itself that it can be. Next we begin line editing. This is where I use track changes to mark up the story. Moving things around, tweaking word choices, cutting all those extra thats which seem to sneak into so many people’s work… After I’ve marked up the manuscript with my suggestions it goes back to the author for them to approve or reject every single change.But wait! There’s more! After all the stories are fully edited I figure out what order they should appear in (this is another process I could write a whole series of blog posts about and it’s definitely a learning process for me. I’ve gotten better and better at it with each anthology), write an introduction, bundle it all together and pass it up to my publisher. The publisher does all sorts of things including formatting it and providing a cover and then proofs are sent out to every contributor, myself and (usually) an independent copyeditor. This is the point where the typos are caught, corrected and then the whole book goes back into the publisher’s hands to work the rest of their magic with. And then, at some point later, the book is published and we begin the process of promoting it. That’s incomplete, of course, but it does give you an idea about what I do to earn my name on the cover of each anthology I edit. Though I don’t write a single word of the awesome fiction you’ll find inside them, I work very hard to make each anthology the best it possibly can be. And then I work just as hard to get it into the hands of as many readers as possible. But that is most definitely the subject for another post on another day. Do you have any questions? I’m happy to answer as best I can. Otherwise, I’d like to thank Nate once again for inviting me to his blog and giving me the space to share a little bit about the job I love so much 🙂 Thank you! Rhonda Parrish is driven by a desire to do All The Things. She has been the publisher and editor-in-chief of Niteblade Magazine since 2007 (which is like 30 years in internet time) and is the editor of several anthologies including (most recently) Scarecrow and B is for Broken. In addition, Rhonda is a writer whose work has been in publications such as Tesseracts 17: Speculating Canada from Coast to Coast, Imaginarium: The Best Canadian Speculative Writing (2012 & 2015) and Mythic Delirium. Thank you, Rhonda, and keep up the great work! Mike Fuller, a fellow historical fiction writer, tagged me in the “777 Writer’s Challenge” in which I’m dared to share seven lines, beginning with the the 7th line down on the 7th page of a work-in-progress. As he turned, a sudden movement caught his eye and he reflexively braced himself. He grunted and twisted his body as a boy slammed onto his back. Wolf Tongue rolled, swinging the boy over his shoulder and locking him in a hug against his chest. Root Cutter, Wolf Tongue’s nephew, struggled against the grip for a moment before Wolf Tongue released him. The boy turned to face his uncle and lifted his chin high. He was growing quickly and strong, one of the few who seemed to be. He almost stood to Wolf Tongue’s shoulders and had a sharp jaw and quick hands. Like his uncle, he wore his hair shaved on all sides and with a lock of hair at the back crest, but today he wore a tight cap dyed red and black. His nose, like that of his mother who was taken by the pox, was arched like a hawk’s beak. Slightly more than seven lines. And also only barely a work in progress, as it will very shortly be released. (Don’t worry, I’ll let you know when it’s out.) But fun anyway, I hope. Thanks for the challenge, Mike! Language of the Bear, a historical adventure set on the frontier of Colonial Pennsylvania is now out in ebook and paperback! The first shipment of finalized paperback editions—they’re so pretty. People have been reading the ebook since May, and for all of you who prefer print, the paperback edition is now available at Amazon (check it out here). Within a few weeks, all other stores like Barnes & Noble and your preferred independent store will be able to order them for you. Yay! So to celebrate, I’m still giving away a signed, free copy to one person who’s joined my email list (hurry – the drawing is on July 23rd! ), and I’m posting chapters 1 and 2 from the book to give you a taste. Wolf Tongue pursed his lips in a small, crooked smile even while his fingers tightened on his knife. He looked to his right through a gathered crowd to the young woman who stood beside her father and winked. Fox’s Smile did not reflect his confidence. Instead of her usual, teasing grin, she stared back with a tightness around her lips that spoke more of concern than jovialness. Her eyes, darkened by lowered eyebrows, darted to the strange man who’d come to their village from the English before coming back to Wolf Tongue. She was beautiful even when she was worried. Last weekend was a storm of writing, outlining, raunchy jokes, planning, beer, and an actual, literal storm. 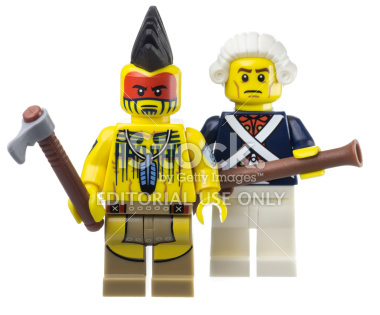 Lego already made a Wolf Tongue and Pyke set! Through the Narrows is almost done! Yes, a little later than we planned (sorry! ), but we’re taking a little extra time to make sure it’s just right. And so far, the reactions we’ve gotten are that this book is even more suspenseful and faster-paced than LOTB. So the release is coming soon and if you want a sneak peek at the cover art and jacket copy, we’ll be releasing that to our mailing lists before anywhere else—so please make sure I’ve got your email. Tomahawk and Saber books 3 and 4 are going to knock your moccasins off. Evan and I did some semi-detailed outlines for the next few books, and as much as I think TTN is upping the tension and thrills, the ones that come after are going to keep that momentum going. No spoilers, but suffice to say I’m very excited to start putting our characters back into harm’s way. This, of course, means lots of writing. How many people can say they’re looking forward to working this weekend? It’s not all that often that Evan Ronan and I get to hang out in person anymore, more’s the pity. Still, our friendship from years ago has made writing of the Tomahawk and Saber series pretty smooth, despite living in different states now. – Some final, very close to FINAL final, edits for Through the Narrows. (That’s book 2 of the series if you haven’t been keeping score.) We’ve gotten some edits back from our editors and now’s the time to work on the final polishes. – Even more exciting is doing the more detailed outlines for books 3 and 4 in the series. We’ve got some solid ideas and plot lines that we think are going to shake things up for our characters (read: make their lives miserable), and, we hope, for our readers (read: make them surprised, but hopefully not miserable). – And also, we’ll probably drink some beer. Possibly cider in homage to the history of 18th century America. After all, I think it was after a few drinks that we had the idea for these books in the first place. So yes, there’s work to be done. But it’s work I love. And also, I’ll get to have some drinks with a great friend. In it, the host of the program explores a little bit about what boredom really does for us and how important it is for our brains and for creativity. Oh, and how our phones and constant internet connectivity might be killing your creativity. And then she issues a challenge to us to join the Bored and Brilliant Project. This is a series of daily challenges to help people take conscious control of their phone, internet, and consider how it affects our brains and our lives. I just started going through the challenges (they began in January, so I’m a little behind—whoops) and the first challenge, as explained in about an 8-minute podcast, was to just leave your phone alone when you’re traveling. No checking texts while walking down the hall. No browsing Twitter on the bus. Just leave your phone in your bag. Seriously – read the article or listen to the episode and subscribe. We might all be smarter people soon. 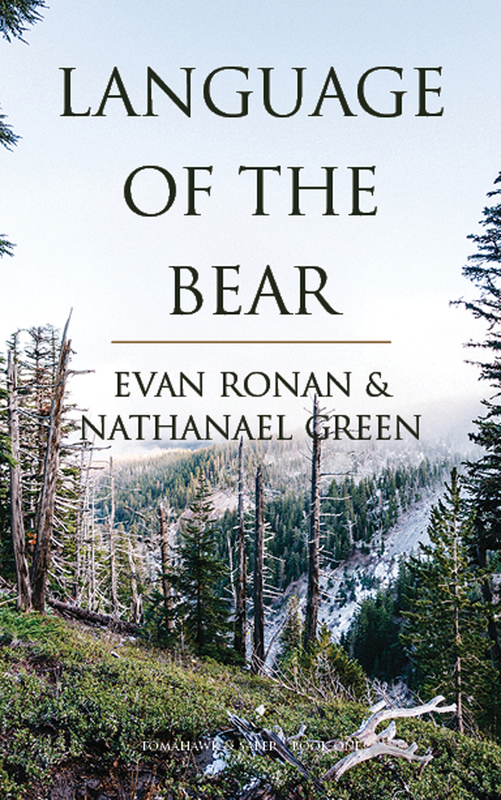 Language of the Bear Cover Reveal! The artwork is here and it’s fantastic! I could go on at length about how much I love the cover and why I think it captures the vibe and feeling of Language of the Bear. But instead, I’ll just leave this here for you to check out … what do you think? By the way, LOTB will be out as an ebook tomorrow! Watch for a link to get your own copy as soon as it’s officially available! Language of the Bear is THIS close to publication! We had some back and forth with our editor for a bit, and are now finalizing edits and cover art. And because publication is so close, I want you to start reading it. click here to get on my list before the book comes out and I’ll send you chapter one of Language of the Bear. And don’t worry about getting hammered with emails—I don’t send newsletters often or bombard you with nonsense. I’ll generally only email you when there’s actual news, special announcements or deals. LOTB is getting so close I can smell the campfires, but the writing goes on for other projects. And everything that goes along with the writing, like the research so key in historical fiction. Here comes the summer reading. LOTB is the first novel in the Tomahawk & Saber series and it takes place in the days just before the French and Indian War. And then the second book, Through the Narrows, brings our heroes even closer to the actual war. (It’s sometimes called the Seven Years War, which is odd because it’s generally marked as 1754 – 1763. You do the math). Then the untitled THIRD book … well, I won’t tell you exactly. 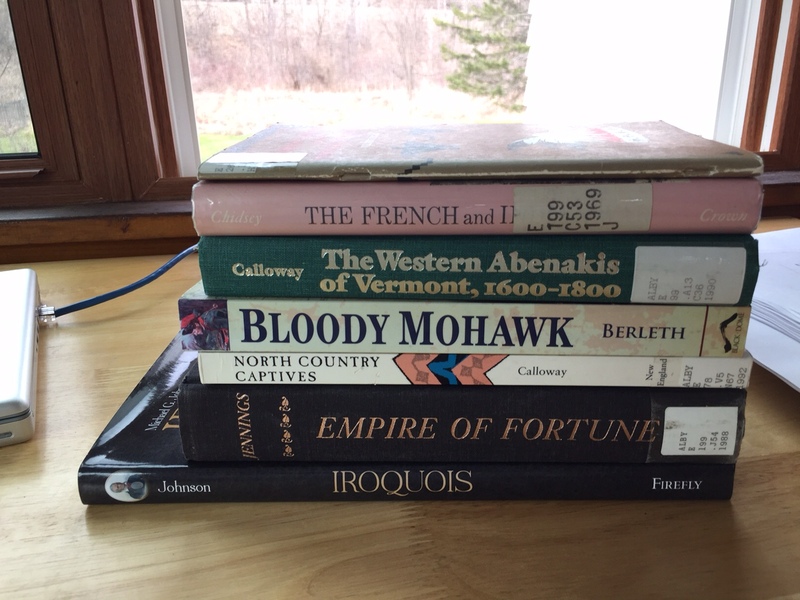 But suffice to say, I’m redoubling my efforts at research for the French and Indian War and all the goings-on around it. Of course, I’ve been reading books about Colonial history, Native American tribes of the eastern woodlands, and all that goes along with that era for a long time. Especially during the writing of LOTB, there was a lot of digging for historical details again. But that book largely takes place on the frontier, away from much of what makes it into history books. Now, though, as Evan Ronan and I are finishing the plotting for the third book, we’re both refreshing our history and getting some additional research in to really make this era and story come alive. I’ve got a stack of books to start with. Some I’ve read before, others not. And the research begins in earnest as soon as LOTB is published.